Most of our small DTG printing orders are shipped out within 72 hours. Large orders can take more time but we always hit our deadlines. And we offer rush or same day printing services at a up charge. We handle everything from the design, prep and print, and drop ship directly to your customer. Have your order shipped directly to a customer and no one ever knows we were involved. We make sure your order meets the highest standards of quality in every aspect possible. Making sure each detail of the order is correct and perfect every time. We offer the latest in DTG & Screen Printing services while offering the highest quality at the lowest price. 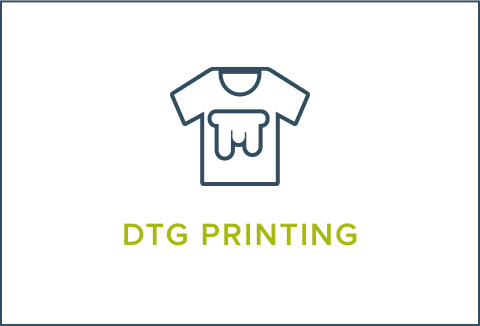 With hundreds of thousands of apparel pieces printed to date, we get every contract DTG printing job done on-time - the right way - every time. The highest quality silk screen & DTG printing at the best price. Our focus is full-color Direct to Garment, DTG printing, a process that uses specialized printers to reproduce a digital image directly onto a garment. We use the latest printing technologies and high-quality, eco-friendly inks that produce rich, vibrant colors on both white- and dark-colored garments. We also specialize in silk-screening, embroidery, rhinestones and sublimation services. We have the ability to customize a huge variety of apparel, including t-shirts, hoodies, outerwear, business wear, pants, and hats.